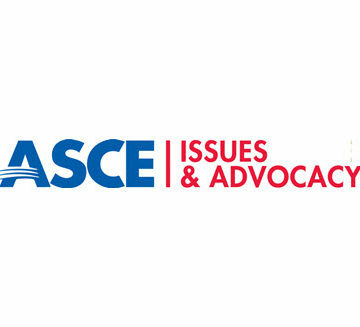 It’s time for ASCE members to help chart the Society’s public policy course in the United States for the coming year. The 2018 Priority Issues Survey is now open for all members to complete. ASCE’s priority issues narrow the focus of ASCE’s government relations, and provide direction for how the Public Policy Committee and its constituent committees should deploy our resources. Each summer we survey the membership to determine the highest-ranking issues at both the state and federal level that you believe we should put our efforts behind in the upcoming legislative session. The list of priority issues, as determined by you are then approved by the Public Policy Committee and Board of Direction. 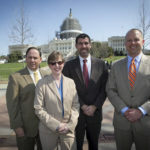 Knowing what issues are critical to you and the profession allows ASCE’s government relations staff to develop a strategy that gives our lobbyists direction, harnesses the power of our network of Key Contacts and ultimately results in legislative successes. Over the past few years, ASCE has achieved victories at both the state and federal levels on our priority issues. 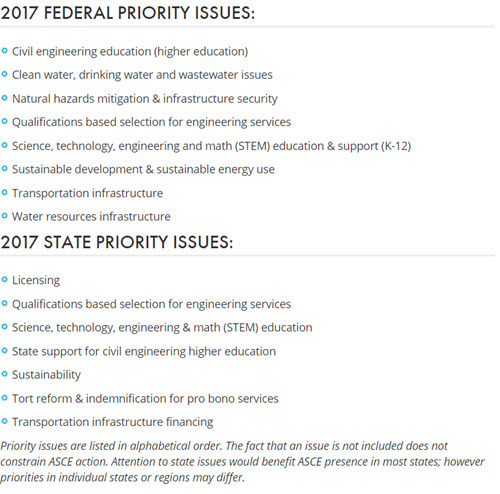 On the federal front, ASCE government relations staff and Key Contacts leveraged the Federal Priority Issues list to seek the passage of critical legislation like 2015’s Fixing America’s Surface Transportation (FAST) Act and 2016’s Water Infrastructure Improvements for the Nation (WIIN) Act. FAST, a five-year federal surface transportation authorization, provides funding for highways, bridges, transit systems and railroads. With the help of input from the Priority Issues Survey, which has consistently named Transportation Infrastructure funding a top priority, our Key Contacts and lobbyists were able to secure the approval of a small increase in funding and the first long-term authorization bill in years. Building on this success, FAST Act funding was included in the FY2017 federal budget passed in April of this year. 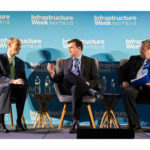 One of the final acts of the 114th Congress was the approval of the Act, Water Infrastructure Improvements for the Nation (WIIN) Act, which included a Water Resources Development Act (WRDA) title. 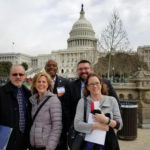 WRDA was another effort invested in because of your issue rankings; it was a multiyear effort that required the heavy lift of ASCE members emailing, calling, and visiting with their Members of Congress both at the Legislative Fly-In in D.C. as well as back home. WIIN not only includes a traditional Army Corps project authorization title, but it also addresses other critical water infrastructure programs including harbors, locks, dams, flood protection, aid to Flint, MI, to assist in lead pipe replacement, and provisions to help California with drought relief. A number of other legislative victories in recent years were born of our public policy priorities. These include: are the Every Student Succeeds Act (ESSA) which was supported by our position, with an emphasis on STEM education, and the National Windstorm Impact Reduction Act Reauthorization, which was advanced by leveraging one our many disaster mitigation policies. Likewise, the America COMPETES Reauthorization Act was shepherded into law using our policies on research among them one that addresses the role of government in civil engineering research and development. On the state side, ASCE directly engaged in specific issues in 32 states in 2016 and as of this point in the 2017 legislative cycle we’ve been active in 24 states. Building off the State Priority Issues list, staff and Key Contacts have defeated threats to professional licensure in six states over the past two years and have worked closely with Section/Branch leadership to seek the passage of gas tax increases or modifications in 23 states in the last five years. Sharing your expertise on what’s happening in the field is the best way to ensure ASCE Government Relations effectively advocates on your behalf and advises you how best to do the same. 2. Facilitate the use of public-private-partnerships(P3s) to accomplish this. This will require OMB and Congress to change the rules and processes to allow the use of P3 for federal facilities used to provide a public service…air traffic control. Questions? Please contact me via e-mail, manuelvega@verizon.net, or phone at 571-332-7135. Coastal flooding and sea level rise.